Summer break is over and it is time to get serious about watercolor again! I will be starting a painting soon that has a lot of darks and blacks in it. 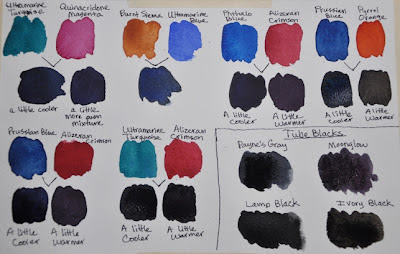 So, I thought I would make this post about painting black in watercolor. I could just reach for a tube of black watercolor, but the blacks I can mix will have more life or color to them. These mixed blacks are called chromatic blacks. They are mixed using dark paints that look black but don't contain any black. Typically the mixes are made from red and green or blue and red. When you are painting with chromatic blacks the color can be varied so that it is cooler in part of the mix and warmer in another area giving more life to the painting. With tube blacks they can look flat because there is no variation. 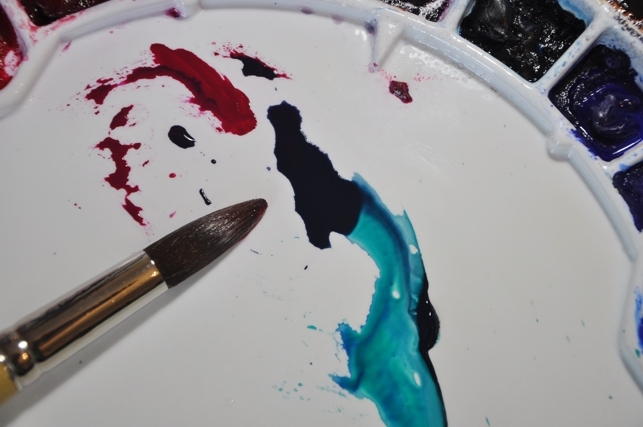 Blacks can be mixed with other colors, but this often leads to dull, muddy color. So before I begin my painting, I decided to do a color chart for some possible black mixes. To the left is my color chart and I have included 4 black colors straight out of the tube on the lower right corner, so that you can see how dark my mixes are. It may be a little hard to see, but depending on how much of each color you add to the mix, you can make the resulting mix cooler or warmer. 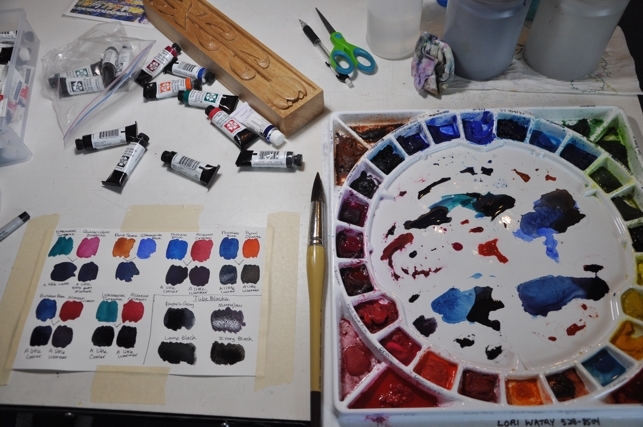 When I do the mixes I pull some of each of the two colors onto the center, mixing area of my palette and then pull some of each color into the mix. In this way I can vary the mix and make it warmer or cooler as needed. When I am pulling color out to make a black, I want to use a lot of pigment. Remember, watercolor dries slightly lighter. The mixes that I made are all good possibilities for darks in my painting. I may use all of them or only a selection. Before I begin my painting, which will be on a full sheet of watercolor paper (22x30), I will do a color study to get a better idea of the colors I will be using. Because this painting is large and I have a lot of darks, I have purchased two plastic containers with lids that I can mix a large amount of a black if needed. However, I plan on using several different blacks so that it doesn't become boring. To the left is my photo and the grid that I placed on top of it to draw it. I don't always use a grid, but this photo is very detailed. 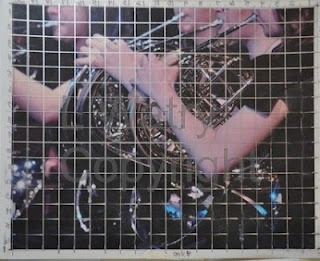 I have added more of the blue reflection to a couple of the french horns and I will adjust values where needed. Now that my investigation of black is done, I can get on with the painting! Even though this pre-planning can take time, in the end it can save a lot of time and headaches. Thanks for sharing the information about creating darks and black. It is very informative. I've never used any of your combinations, and will try them since they produce interesting darks. I use Alizarin Crimson and Thalo Green to create black. Your "French Horns" painting looks like it will be quite a challenge, but I'm confident you'll achieve another winning work. Thanks for commenting! I can't wait to get started on the French Horn painting. I will have to try your black mix, too.